In recent years, significant advances have been made in the response to HIV, and a positive diagnosis that was once effectively a death sentence can now be managed through easily and cheaply available antiretroviral treatment. Despite this progress, several challenges continue to exist: effectively diagnosing all cases, ensuring access and adherence to treatment, reducing transmission, addressing gender and racial disparities. These challenges are nowhere more pronounced than in the KwaZulu-Natal province of South Africa, where a quarter of the adult population lives with the virus. By contrast, less than 0.5% of adults in the United States live with HIV (although significant racial and other disparities in this burden exist). First on our itinerary in South Africa was a visit to Edendale hospital, close to Pietermaritzburg, in a district with one of the highest prevalences of HIV in the country. At the hospital, we entered a pre-fabricated office behind the main building, and were greeted with song, dance and “Sani bonani” (“Hello” in Zulu). 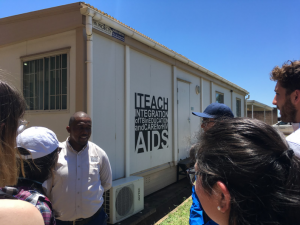 Edendale hospital is home to a program called iTEACH, which integrates tuberculosis in the education and care of HIV. 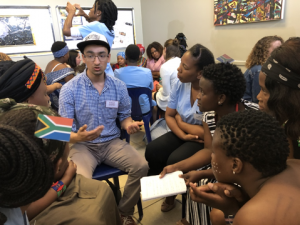 Tuberculosis (TB) is the most common cause of death among AIDS patients in South Africa, and at the heart of iTEACH’s operation are “TB warriors” – a group of healthcare workers that screen patients, collect samples for testing, and deliver TB test results to clinicians. Their work behind the scenes makes it more likely that clinicians will diagnose and prescribe treatment for TB, and that patients will receive and take those prescriptions, which is essential to reducing the mortality attributable to HIV/AIDS. We toured the hospital and met with a TB warrior and her co-workers, who described their work as challenging: they were understaffed and sometimes had too many patients to screen. Despite this, they said they loved their jobs. Another component of iTEACH is a collaboration between the hospital and traditional healers, or Sangomas. 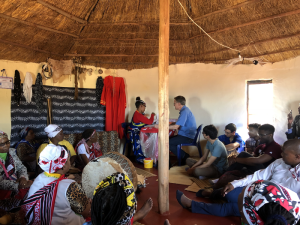 Sangomas are trusted members of rural communities, and offer a way for more effectively screening and treating people with HIV. We visited a group of Sangomas working together with iTEACH, and were greeted with a ceremonial welcome. Through a translator, we asked them questions about the program, and got a live demonstration of how they perform HIV testing, using one of our instructors, Bruce Walker, as a mock patient. The Sangoma explained the biology of HIV and how the test worked using a picture booklet inspired by Atul Gawande’s idea of checklists. The Sangoma was also exceptionally witty, and when Bruce asked how she dealt with difficult patients, she said she didn’t have any, and that was because of “how I talk to the patient,” implying that they spent more time with patients than MD doctors. When asked if the model of Sangomas working with hospitals could be replicated with other traditional healers across the country and continent, the Sangomas unanimously said “Yes”. Later on, we had a traditional meal and the Sangomas sang and danced, and offered a hand to us and brought everyone into a dancing circle. Tackling an epidemic as complex as HIV requires collaboration between a variety of stakeholders, and our time in South Africa also included classroom sessions with other key players in this fight: researchers from Gilead who spoke about the history and future of HIV drug development in the pharmaceutical industry; clinicians and epidemiologists whose research has shaped public policy; a scientist and advisor to the Gates Foundation. These sessions reminded us of the importance of engaging with the public, private and non-profit sectors, in addition to patients and healthcare workers. We witnessed one example of such an active engagement model at a shopping mall in a township close to Durban. Townships in South Africa are historically segregated urban areas, and although Apartheid officially ended in 1994, many townships continue to be underdeveloped. In the one we visited, Umlazi, about two-third of women become HIV positive by their mid-twenties. 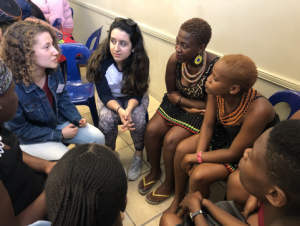 Unlike the United States where gay men are at highest risk for HIV transmission, young women bear the greatest burden in South Africa, a pattern repeated across sub-Saharan Africa. The shopping mall we visited was chosen as an easily accessible site for women who were recruited into HIV-related research studies conducted by the Ragon Institute, called the FRESH program (Females Rising through Education, Support and Health. A distinguishing feature of FRESH is that in addition to being a study site, it also offers a host of programs aimed at women’s empowerment: health education and screening, computer training, career exploration and counselling. At research institutions, we often study things in isolation: mechanisms by which pathogens cause disease; compound screens to discover the next big antibiotic or antiviral; methods to improve the sensitivity of a diagnostic test. Yet the reality of how diseases manifest themselves is far from isolated. To the women in FRESH, the worry around potentially turning HIV positive lives right next to the anxiety of finding employment, of being in a faithful relationship, of raising healthy children, of not being judged for their choices. In this regard, FRESH offers a unique way of tying together tightly defined research questions with the delivery of broader public health and social services. We toured the facility and met with women currently participating in FRESH. We asked them about their favorite parts of the program (“Field trips!”), their career goals (“Accountant!”, “Nurse!”, “Model!”), and answered questions they had for us – how was life different in America? Are you dating? Do people talk about HIV in the US? Towards the end of our visit, FRESH graduates and participants put on a show of song and dance. One song they sang was “Ngcwele,” led by a recent FRESH graduate who now worked with the program as a recruitment coordinator. Later that evening, we, along with members of the FRESH and iTEACH teams, attended a screening of the Zulu film Yesterday, which depicts the personal toll a HIV diagnosis can take on families. We then had dinner together and the end of the night was marked by song and dance, yet again. But before that, we heard a story about a Zulu choir, comprised of HIV positive women, that made its way to Boston back in the early 2000s to sing at a research conference; of how they used money raised by selling records to fund treatment for choir members who needed antiretrovirals. It was a remarkable story, and we learned that one of the choir members was with us at the dinner, and that she was going to sing for us. This singer turned out to be the same TB warrior we had met at iTEACH! She, along with everyone else who knew the words, sang “Shosholoza,” a song of hope and solidarity. Soon, everyone in the room was either singing, dancing or both singing and dancing. iTEACH and FRESH represent only some of many more programs and people we interacted with in South Africa, and the entire trip was filled with similarly unique experiences: visiting CAPRISA and AHRI, two state-of-the-art research facilities in Durban and at rural outposts, hearing personal accounts about living through Apartheid, meeting with HIV positive mothers who had passed the virus on to their infants, and finally, as a way to bookend the trip, going on game drives at a nature reserve. 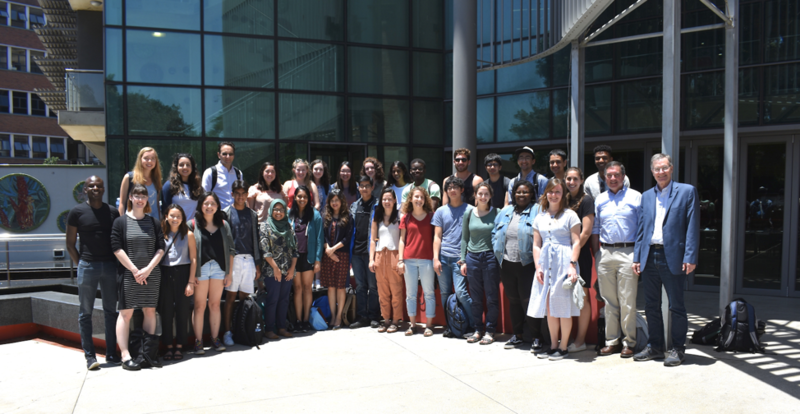 Students also got to synthesize their knowledge from the trip through a couple of activities: using epidemiological data to identify and present novel research questions; and applying ethical and economic insight to evaluate policy recommendations. Looking back and thinking of the ways in which the trip has and will impact us, one might wonder about practical ways in which it might be useful: potentially conducting research in South Africa; finding collaborators; shaping our own research based on the needs we saw. But there is also an impact from the trip that transcends the practical. 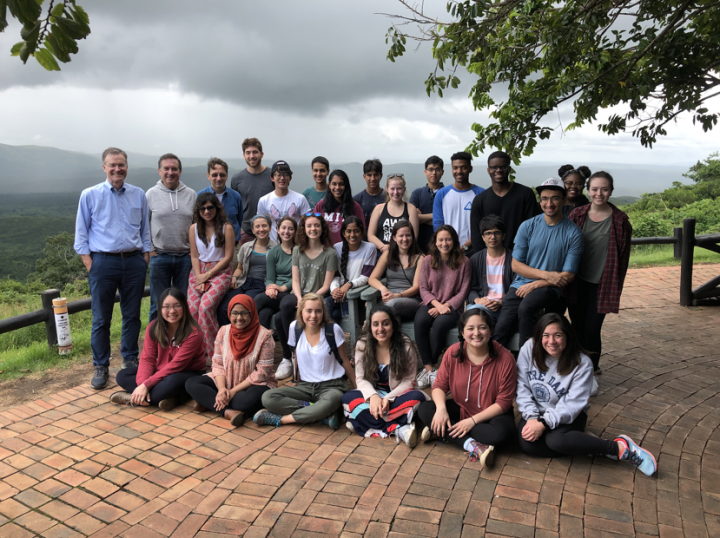 In many ways, being in KwaZulu-Natal was a sort of spiritual experience: a reminder that great things can be done when people that care come together; that the everyday people around us each have an incredible story to tell; and a reminder of why we, as young scientists in medical fields, come to work each day. We have found a Youtube version of “Ngcwele” and numerous renditions of “Shosholoza” online. These songs of KwaZulu-Natal are a way to relive our experience there, and to remind us all of the hope and solidarity that exists in this world.